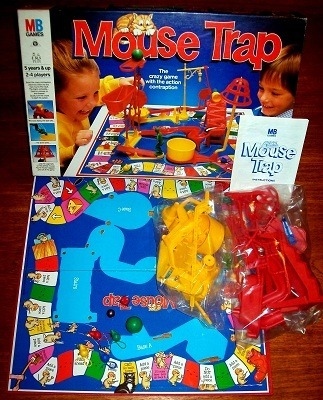 MOUSE TRAP: The crazy game with the action contraption. Build the crazy contraption piece by piece as you race round the track. The trap's complete and there's a mouse on the cheese! Quick! Turn the crank to start the action: the boot kicks ... the ball rolls ... the diver dives ... and the cage falls on the greedy mouse. You're mouse is trapped and out of the game! This is a very good example of a much sought-after board game classic. The game itself is in nice condition: every piece is present and the game board is in very good condition. The rule booklet is worn but still perfectly legible.